Seamless and retractable, the Alley Rack™ offers a prime bike parking solution for dense urban environments, constrained multi-use areas or even where a minimal footprint is just simply preferred. 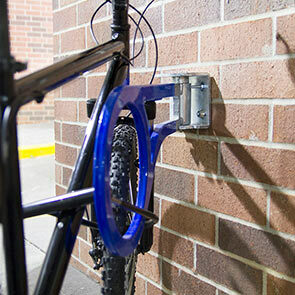 The wall-mounted Alley Rack™ features a hinged arm that swings 180° with 5 locking positions perfect for securing up to 2 bikes in tight flexible spaces. The space saving bike rack acts as a formidable deterrent and is universally accepting of just about any popular bike lock type. Constructed with thick 5/8" laser cut steel and finished in a resilient thermoplastic coating. It's recommended that the Alley Rack™ should be installed 32" off the ground and have at least a	radius of 70" around the rack for best usability. Compact, practical and economical are common descriptions of the Alley Rack.